← What Are You Going to “BE”? By using social media to share updates, photos and news, companies show their personality, flaunt their work style and share their values. As a job seeker, this is a beaming light of opportunity! You can leverage the company’s social media presence to research their culture, and then cleverly include those attributes in your cover letter and interview to show that you would be a great fit at the company. First things first: Open a Twitter account if you don’t have one. Pick a professional username (also known as Twitter handle). Then, type in your desired company’s name in Twitter’s search field. Most of the time, professionals who work at the company mention the name in their bio—so finding them is a piece of cake! Follow all of the accounts that are most relevant to you. 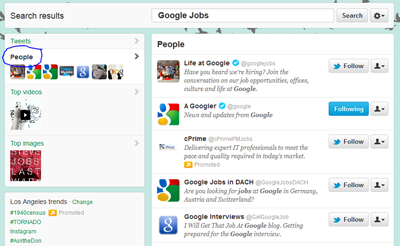 In order to be super thorough, search “Google HR” or “Google Jobs” to get even more results about working at Google. Now we know not every company is as easy to find as Google, the King of Search! Having trouble finding a company? Try searching through Twitter director Listorious. Twitter lists are a great way to keep tabs on similar peeps on Twitter (Tweeps) so that, for instance, if you want to check up on what’s going on with Google only, you can assign all of your Google folks to a “Working at Google” list for easy access. Remember to check the “private” box if you want to keep this job hunt on the down low. Socialmention.com is kind of like Google Alerts—but for the social media scene. The way it works is, you type in the company name and the Social Mention bots will search, as they claim, “content from across the universe!” Or you can use the handy dandy filter search to limit the search to: blogs, microblogs, networks, comments, events, bookmarks, images, news, videos, audios and questions. So anytime the company name is mentioned in those platforms—you can opt for real-time results right on the website or sign up for daily email updates about the company! More cool points for Social Mention: They even offer stats about the sentiment of the conversation: positive, neutral or negative. Let’s test it out! 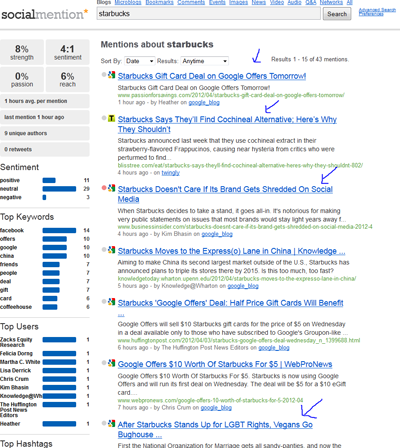 What if you want to know what people are saying about Starbucks on the blogosphere? Viola! From this quick search result, we learn that Starbucks is teaming up with Google to help folks save money—and if you click into the article, you’ll find that the promo aims to help benefit the “Create Jobs for USA” fund. This offers a great starting point to dig deeper about what type of things Starbucks does to give back to the community, etc. One Business Insider article that shows up talks about how Starbucks is very gutsy when it comes to public statements online — not caring about pleasing everyone on social media, and instead caring more about what they believe in (issues like gay marriage and gun control). All of this is great background and insight into the Starbucks persona and culture. Want to go the extra mile? Set up an alert for the CEO or your would-be boss to see what others are saying about them. By now we’re hoping you have a LinkedIn profile set up. If not, drop everything and do it right now! Then learn more about the company by searching for the LinkedIn company page. Here’s why LinkedIn is so awesome: The company’s page will show you the company logo and a brief description followed by a list of professionals who work at the company in order of the people with whom you have the most shared connections! How convenient is that? Browse around to see which professionals are connected to your network and then shoot them a message! While writing, think “anti-spam” and be professional. Try to offer something to the recipient, whether it’s a compliment on a recent article they shared or just express your interest in staying connected to share industry info. Facebook remains to be one of the most widespread social media tools. You can’t get away from it. Some of the most popular companies on Facebook include Wal-Mart, Subway, Target and Disney – not to mention CareerBliss! Facebook hosts thousands of company fan pages, so it’s worth a shot. Search the company you’re interested in and hit “subscribe” for instant access to their updates. Pay attention to the content of their updates. Are they community-oriented? Does family strengthening seem to be a consistent theme among their giveaways and contests? In addition to main company websites, some companies operate a separate staff or team blog. The newest social media crazy Pinterest is a great platform to check out because it’s image-based and more and more companies are noticing that Pinterest is a great opportunity for some serious marketing. Did you check out Kotex’ awesome video “the first Pinterest campaign in the world?” You can tell from the campaign that they value more than just selling feminine products — they value empowering women, a huge component of their company culture! You’ll find the same message in their community blog: The Ladies Room. Blogs are a huge culture research asset! Okay so Google+ is kind of slower on the social media scene. But it’s still worth logging on. After all, social media is ever-changing and you never know what type of exploding stunt Google might pull tomorrow that will have everyone leaping onto the Google+ bandwagon. So, find your desired company and search for professionals with whom you’d like to work and start circling! If they’re active—what are you waiting for? Start exploring and engaging! This entry was posted in Job Search, Social Media and tagged company culture, inside scoop, Social Media. Bookmark the permalink.